You decide whether you want to use your army to secure your power base in the best traditions of corrupt, unscrupulous tyrants everywhere or lead your people to prosperity in your role as generous elder statesman. No matter whether you turn Tropico into a vacation paradise, a police state or a modern industrial nation - you will always have to defend your actions before your people! Wander through Tropico as El Presidente in order to intimidate political opponents, hold populist speeches or just to enjoy your country's own Caribbean flair. History takes its course with events such as the Cuba crisis, papal visits and other actual decisive historical events. The only question is whether or not you can play a role in that history! To promote Tropico 3 and grow its popularity (top games), use the embed code provided on your homepage, blog, forums and elsewhere you desire. Or try our widget. 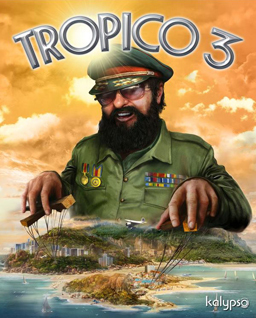 The playable Tropico 3: Gold Edition demo for the Apple Macintosh. The 1.13 incremental patch for Tropico 3. The 1.11 cumulative patch for Tropico 3. Download the playable Tropico 3 demo now.